Anguilla is eco-tourism friendly. Rich with vibrant wildlife and active eco-systems, on a recent expedition with Nature Explorers Anguilla, owner and operator Jackie Cestero brought this little known fact to light. Originally from upstate New York, Jackie relocated to Anguilla in 1998. 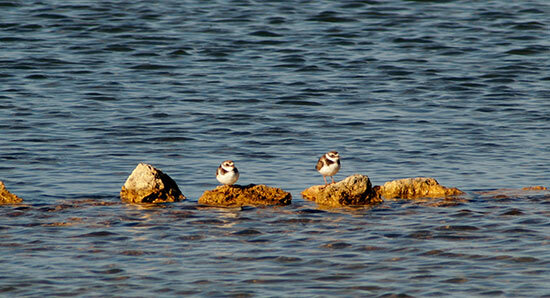 She is an avid birdwatcher and nature photographer, with a vast knowledge of Anguilla's native and migratory species. She's traversed all of Anguilla's terrain, including the off-island cays (even the ultra-remote Sombrero) in search of various species. She knows the island and its wetlands like the back of her hand. 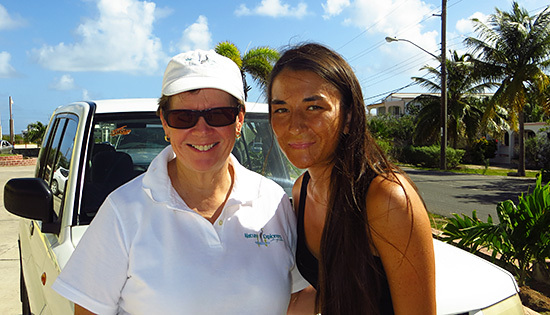 Curious about Anguilla's wildlife, there's no one better to explore with than Jackie. Wake up time for our tour? 5AM! In her comfortable 4x4, Jackie picked me up at the crack of dawn, ready for an early morning of birding. 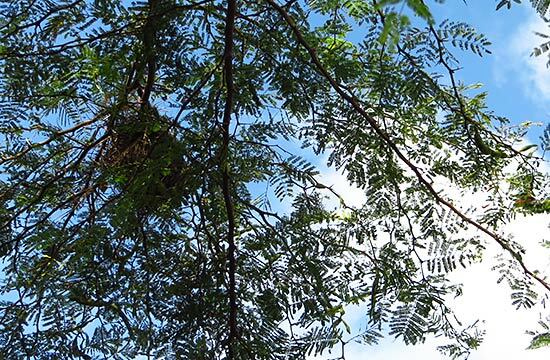 The benefit of an early wake up call is two-fold... first, it's typically the best time to spot birds. Second, the sunrise (see photo above)! Long Pond was our first stop of the day. Set on the island's south side, this pond is more exposed as it's right across from Long Pond Bay, a bay that faces due east, totally exposed to the trades that blow in from the east. True to its name, Long Pond is indeed long. Jackie was armed with binoculars and handed me an extra pair (she brings binoculars for guests on her tours). The birds were hiding out on the edges of the pond, shielding themselves from the wind. We walked carefully along the outskirts of the pond, eyes wide open and waiting. 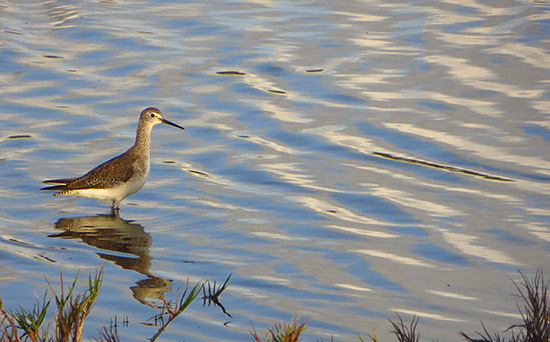 On calmer days, I have seen many Egrets and Plovers in the wetlands here. The wind didn't let up at all, so we moved along to East End Pond. Jackie's tours include visits to 2+ ponds. The ponds visited depend on Mother Nature and the day's conditions. Calm and still, East End Pond is a go-to site for birdwatchers. 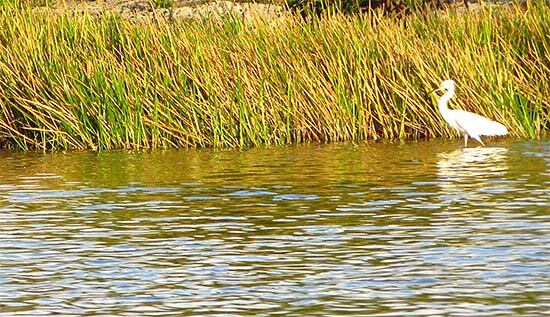 As we pulled in, an Egret hanging out in the tall grass greeted us. 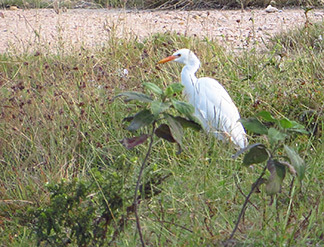 Jackie noted that this is a Cattle Egret, the smallest of the three types of Egrets that live in Anguilla. 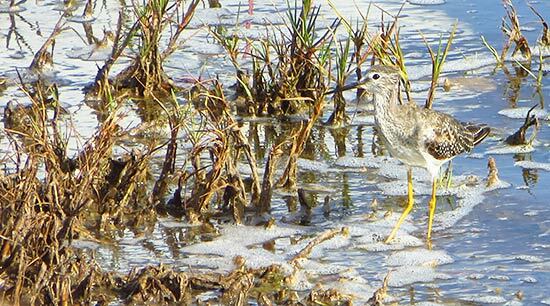 She was able to identify it by its yellow bill and tan wash, which only comes out during breeding season. I was amazed by her knowledge, including how the colors change during breeding season! Jackie parked the car and we walked over to a small clearing in the brush. Armed with binoculars, I scanned the edges of the pond. Jackie nudged me and whispered, "there!" 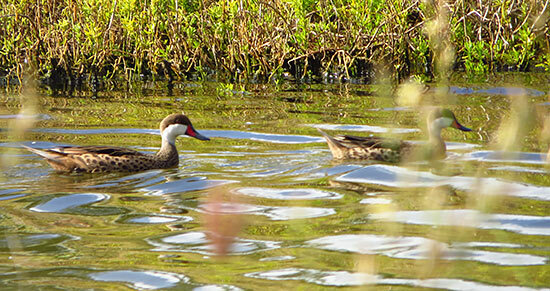 A pair of White-Cheeked Pintails were gliding ever so elegantly along the pond. Ducks? In Anguilla? These were the first I had seen on-island. All quiet, we went back to looking. As we watched, I couldn't help but notice how lush and beautiful this pond is. 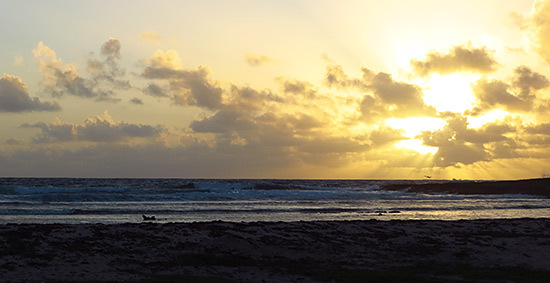 It's no surprise though as the area itself is protected and preserved by the Anguilla National Trust. They have even constructed a few look-outs where you can comfortably sit and bird watch. 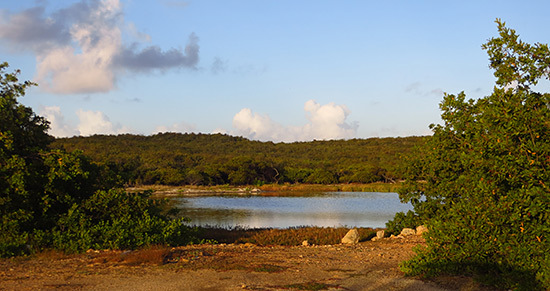 If you're really interested in Anguilla eco-tourism, a visit to this pond goes hand in hand nicely with Colville Petty's Heritage Museum, located just across the street. 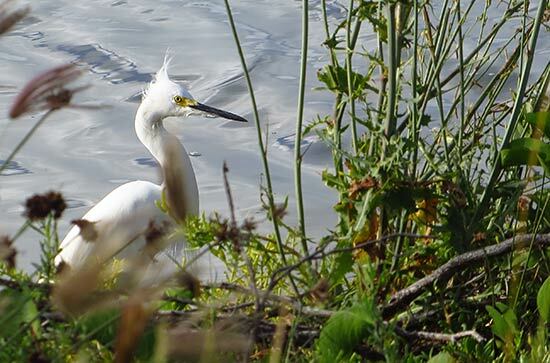 It wasn't long before Jackie nudged me again pointing out another Egret, this time a Snowy Egret. "It's the medium-size Egret, the largest is the Great Egret," she went on to explain. I snapped a few photos. The morning light makes for terrific photo opportunities! 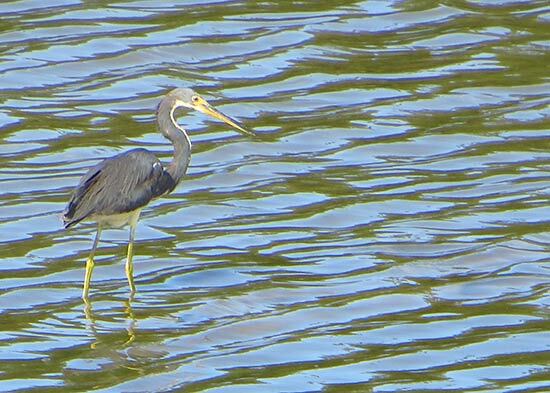 Now, we were just waiting on one bird to appear... a Heron. "I'm not sure if he'll make an appearance today, since it's so windy," Jackie said a little concerned. But then, we spotted him. I could have missed him, completely tucked into the trees, blending in with his environment. But Jackie doesn't miss a thing with her "eagle eyes." We got back in the car and drove around to the other side of the pond, on our way to Caul's Bottom. 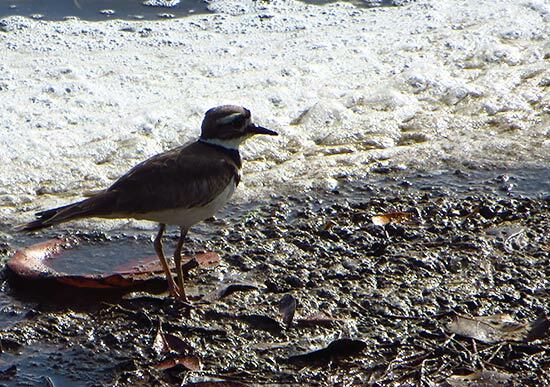 Along the way we spotted a few pretty Plovers and Long-legged waders. Down a deserted dirt road filled with potholes, Caul's Bottom is truly tucked away. In the middle of Anguilla, protected from wind, this is one of the most reliable spots to visit if you're seeking some real bird action. Was that ever true! 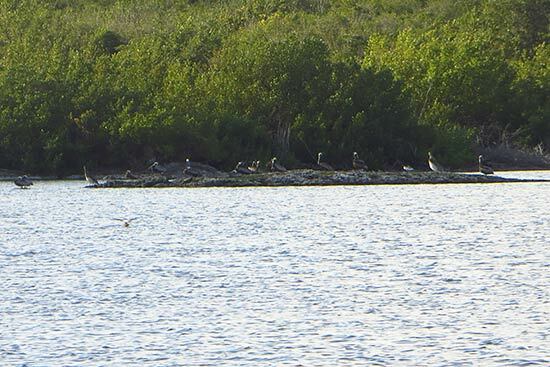 Pelicans, ducks, they were all taking flight when we arrived, only to quickly land and roost on a spit of land within the large pond. 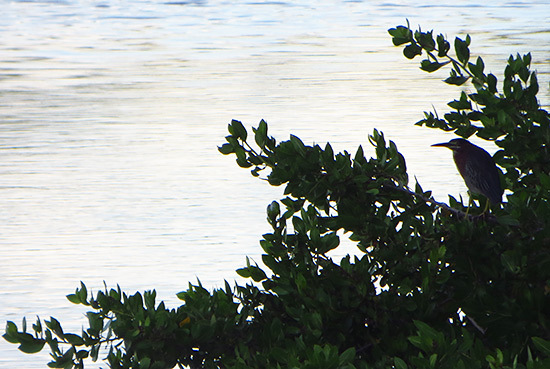 "Many of the rarer species hang out in the mangroves that line this pond," Jackie explained. She's used a spotting scope to see things up close on the opposite side of the pond. We walked through the brush surrounding the pond and spotted more bird evidence, including bird nests and heard many bird calls in the distance. 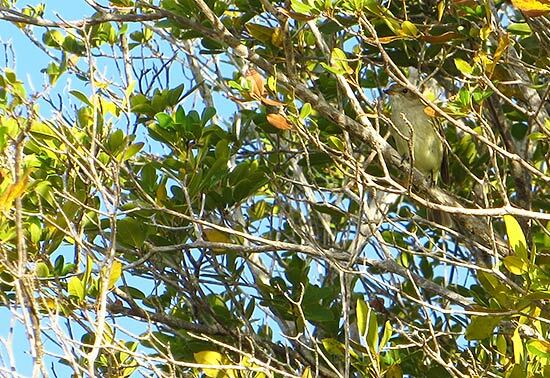 A moment of excitement came when Jackie pointed out a bird that is hard to come by, one that is indigenous to the area, the Caribbean Elaenia! Satisfied, it was time to turn the car around and head west. We were on our way to a famous pond, Road Bay Pond. An important site historically, the Road Bay Pond was the site where Anguilla produced salt for many years. The Pumphouse, a popular and funky bar frequented by many, is actually a historical site, a true part of Anguilla's heritage. 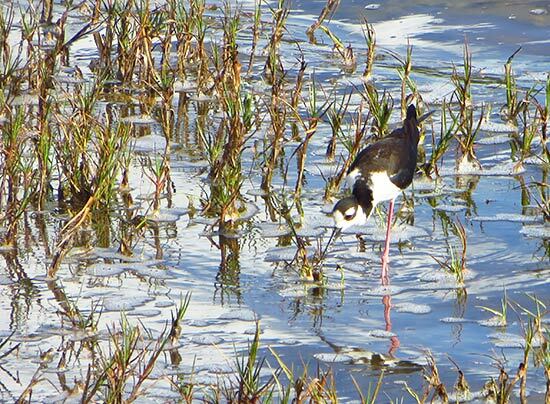 Pond-wise, many bird species co-exist here, sharing the shoreline. In Jackie's car, perfect for exploring, we drove along the pond's edge, keeping our eyes peeled. We didn't have to look hard or long before spotting some interesting sites. 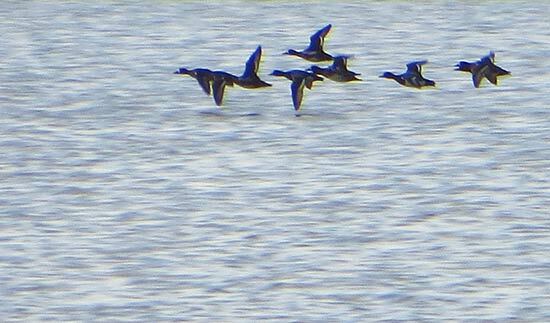 First, more White-Cheeked Pintails! These ones were on their way down the little channel that leads from the pond to the beach on Sandy Ground. 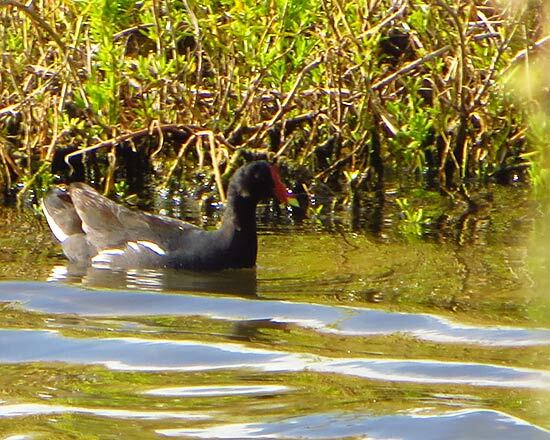 Waterfowl-wise, we even spotted this rare beauty (above), the Common Moorhen. With a red bill, he sure stands out. Another Snowy Egret appeared next. 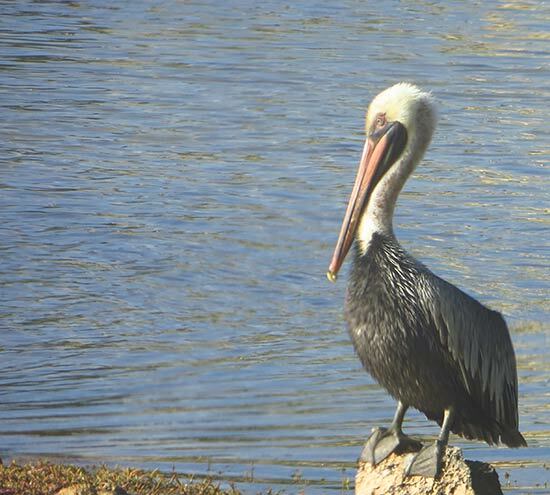 And then, a magnificent Pelican, standing all alone. We approached him slowly and carefully, trying not to disturb him. We snapped a couple of shots, Jackie equipped with her professional camera. Her shots (which you can see on her website) are awe-inspiring. Something truly special happened next. 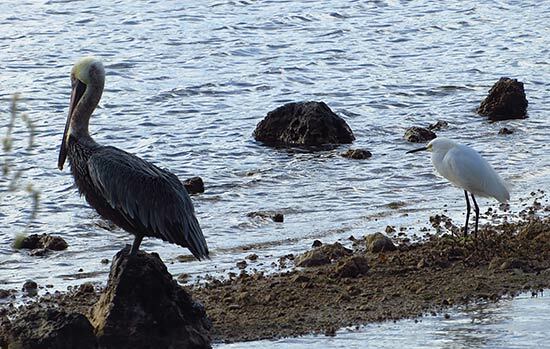 The Snowy Egret came alongside the Pelican, sitting right next to him as if they were long-time friends, enjoying the morning sunshine together. Just as we were preparing to move to the other side of the pond, Jackie pointed something out. 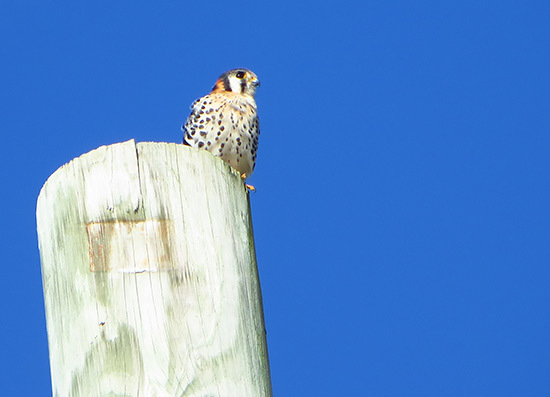 I don't know how she spotted it from inside the car, but way up on the top of the telephone pole was one of Anguilla's predatory birds... the American Kestral, or commonly referred to in Anguilla as the Killy Killy. Birds of prey, they feed on small rodents, which likely explains why he was way up high on the telephone pole. 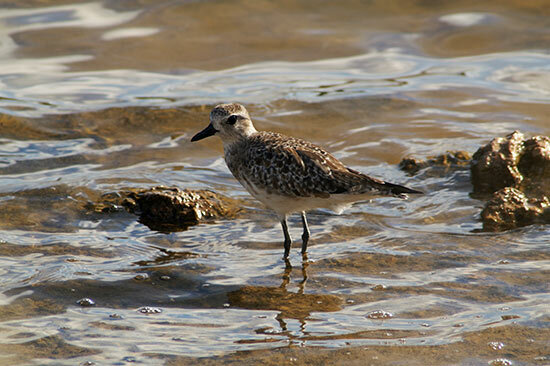 Along the other side of the pond, we spotted Plovers of all kinds, including sub-species we hadn't seen earlier. After marveling at the sweet shorebirds, it was time to head further west. 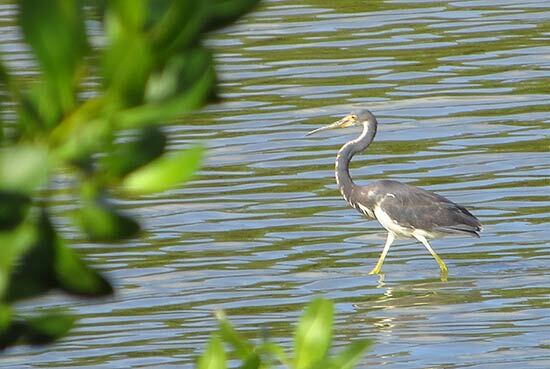 Jackie was set on finding two types of Herons that she had seen earlier in the week. 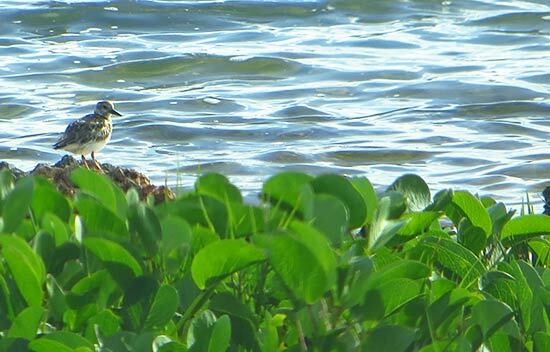 Uncommon to Anguilla's wetlands, spotting these birds would be a special treat. 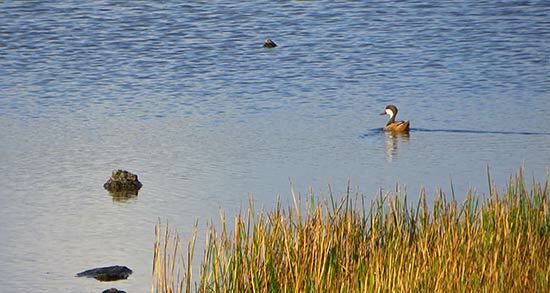 The birds, including the White-Cheeked Pintails, were still sleeping, all wrapped up in their feathers. 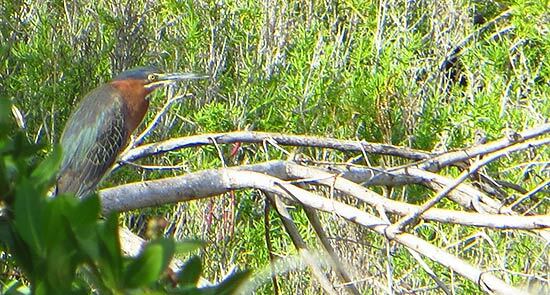 We hung around for a good 20-30 minutes watching them wake up, patiently waiting for the Herons to appear. Just when things were starting to feel hopeless, something stark and elegant emerged from the bush, moving with purpose across the still water. What luck! Its colors were fascinating! With that, we headed for home. I thanked Jackie for such a delightful outing. 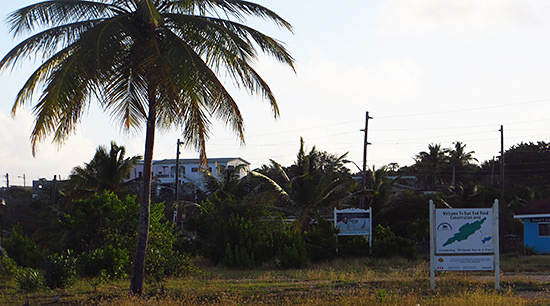 For the first time in all my years of visiting and living in Anguilla, I saw a different side of Anguilla, a natural side, one away from the beach, rich with wildlife. With her passion and knowledge, Jackie made it a morning well-spent. 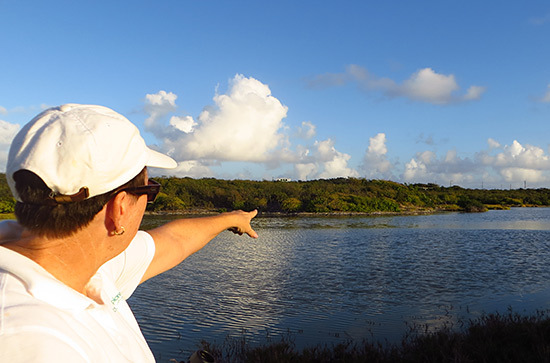 Jackie holds a number of tours, including the wetland tours, photography tours and she can arrange special tours of off-island cays to the likes of dog island where you can spot some truly rare and interesting birds. Also, Jackie has published a number of books, reviews and quarterlies on bird life and bird life specifically in Anguilla. Visit her site (link below) for more information.